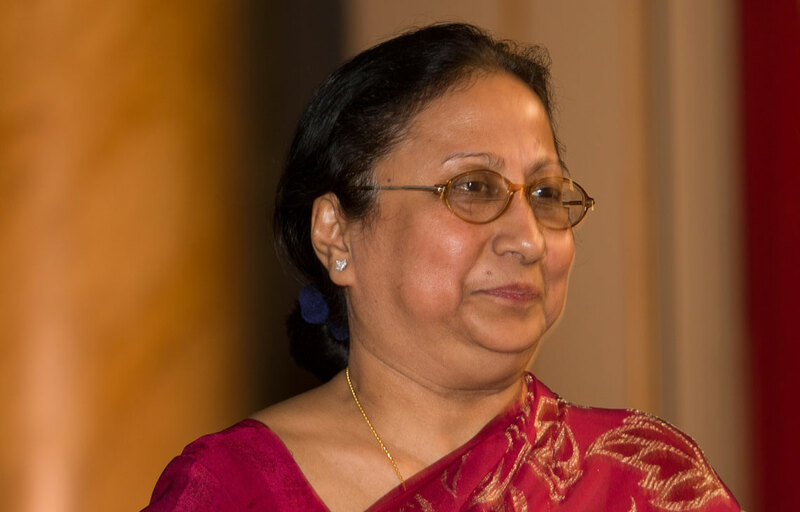 Shahida Pervin first became aware of Shakti Foundation for Disadvantaged Women in 1994 while pursuing a geography degree at Dhaka University in Bangladesh. One day, she saw news about Shakti’s activities in a bulletin published by the university’s Centre for Urban Studies. She was inspired by the organization’s mission and goal and decided that she would work with Shakti after graduation. What drove you to create Shakti Foundation, and how did you go about it? Humaira: From my childhood, my dream was to do something for the underprivileged women in society. I had seen and heard of deprivation, stress, lack of respect for women in their family life. It gave me pain. I thought of doing something for them. My PhD topic was women’s empowerment. I found that women have no rights even in their families. They cannot make any decisions regarding children or any other family matter. This happens as a woman doesn’t have money to financially support her family. Realizing this truth, I thought of doing something after completing my PhD. I found that the Grameen Bank model of microcredit was successful in the rural areas, and I thought of using this model for women in the urban areas. In 1992, a few young men and women who believed that financial independence could bring freedom and security for women in her home and society, got together to test this among women in low-income households in Dhaka, the capital of Bangladesh. In the beginning there was no money for the project, so with a small personal contribution from myself, the first disbursement of taka 15,000 (US$ 187) was made among five women. All these women eventually graduated as successful role models for their peers in society as entrepreneurs, leaders and change-makers. What had started more than two decades ago as an experiment has today turned into a mega program in Bangladesh. We have a huge coverage area over the country. Hundreds of thousands of women in low-income families have improved the quality of their own lives and those of their children by having access to education, health, housing and opportunities for employment and income. I had asked one of the donors at that time, “When would you consider the program a success?” She told me that if you can get a maximum 60 percent loan recovery rate, we will consider the program a success. One year later, we had collected 100 percent of the entire loans disbursed. This created confidence among other microcredit institutions. Thus, the foundation of an urban credit program was laid in Bangladesh. What were the early challenges for Shakti? Humaira: During the start-up stage, there were many challenges. The biggest challenge was to prove that a credit program in the urban areas was possible. The belief during the period was that the urban poor were migrants and had no fixed or permanent address, as opposed to the rural poor who had a fixed address. Therefore, any loan given to them would result in default. The second challenge was about gender in a traditionally male-dominated society where all microcredit programs were run by men. I was not very welcome in their territory. Most had a paternal, tolerant attitude toward me—giving the impression “you are here but do not overstep your boundaries as an institutional leader.” These institutions tried to create psychological pressure in many ways. But I have prevailed. How has Shakti promoted women empowerment in Bangladesh? Humaira: The idea of working for the urban poor instead of the rural poor originated from a 1989 research study “Situation Analysis of the Urban Poor”. It observed that the situation of the urban poor is worse than that of rural poor in terms of: 1) living conditions, 2) employment, 3) literacy, 4) health and 5) sanitation. The majority of slum housing structures are very weak. Poverty and unemployment—these problems are particularly acute for women. Disadvantaged people in urban area are easily trapped in a cycle of poverty. Those without land and little, no education and low income face tougher obstacles in finding adequate employment, bringing up healthy families, and weathering economic downturns. Women are particularly vulnerable, lacking in social position and legal rights and traditionally earning less than half than men. Shakti Foundation addresses its mission through an integrated approach. The core program is microcredit, but three other programs are being implemented: health, solar energy and agriculture. In addition, the graduates of the microcredit program are given support for business expansion to medium enterprise. The objective of SME (small and medium enterprise) is to provide opportunities and enable Shakti members to enter those markets. The experience clearly indicates that lack of capital is still the main problem, with the absence of marketing facilities and a proper sales center as additional major problems. Another common barrier faced by women entrepreneurs is balancing time between the enterprise and the family. Other limiting factors are the availability of machinery, equipment, technology and power. SMEs have a bright future for urban women. This sector can absorb a chunk of low-skilled and less-educated urban women. If the major barriers in marketing for women entrepreneurs are removed, then a huge number of women will be able to lead the sector and contribute to the nation’s economy. What is the future of women’s empowerment in Bangladesh? Humaira: As a young woman I had traveled to rural areas in Bangladesh for my doctoral thesis, which was on “Empowerment of Women in Bangladesh. “While the popular thinking was that poor women were weak and subservient, these women were actually resilient, energetic and feisty. What they lacked were opportunities that would enable them to live the lives of their choice—marriage, child birth, recreation, etc. There is resilience, productive energy and drive for quality of life in every woman especially among low-income households. Financial services by MFIs (microfinance institutions) over the last four decades have helped in creating an enabling environment so that women jointly with the men earn and contribute to the budget. In the recent decade, microcredit has created a new level of entrepreneurs. The challenge for the new generation of leaders is to design a structural and operational framework so that micro entrepreneurs can sustain and grow in a highly competitive male market. We need to reformulate microcredit policies, create innovative strategies and use technologies to help the new generation of micro entrepreneurs move forward to greater growth. How do you feel about the “Excellence in Leadership Award” awarded to Shakti by Women’s World Banking for its contribution to gender diversity, principled leadership and excellence in financial and social performance? Humaira: It was really a wonderful thing to get the leadership award. It is the achievement of 500,000 members and 3,000 staff. Shakti always believes that women can change their fate with their own effort. Shahida Pervin is the Deputy Director of Shakti Foundation for Disadvantaged Women in Bangladesh where she has served since 1995.